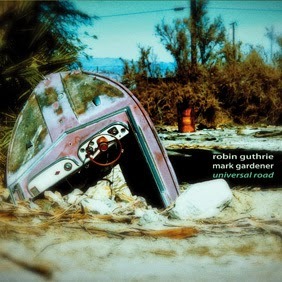 Mark Gardener (Ride) and Robin Guthrie (Cocteau Twins) released their highly anticipated collaborative album Universal Road this week. The two shoegaze titans previously released a single titled "The Places We Go" in 2012 and not long after the pair recorded a full 10 track album. Though the release was delayed due to several other projects Guthrie was working on, the album is finally out and was unquestionably worth the wait. Universal Road is indeed a masterpiece! The songs are alluring, elegant and breathtaking. Gardener's rich and soothing voice pairs perfectly with Guthrie's flowing, graceful guitars, resulting in one fantastic album. Universal Road was released this week through Soleil Après Minuit and is available to purchase through iTunes, Amazon, and Robin Guthrie's website. The tracklisting is posted below along with footage of Gardener and Guthrie performing "Dice" captured live at their February 2013 show in London.